The Cuisipro Donvier yogurt and cheese maker will prove a great addition in any kitchen where yogurt cheese is in high demand, an alternative to fatty mayos and cream cheeses, this is a great product to have in your fridge, especially if it is homemade. If you currently employ other methods of making yogurt cheese, then you will love what this maker is bringing to the table. So without wasting any more time, let’s look at what makes it special. Starting with how solid this unit is, it is easy to tell that it was meant to last years. Although the container is made from plastic, it still looks safe to put up with a lot of abuse. As for the stainless-steel mesh filter, it shares the same durable quality as the container. Getting to the most important part of how it performs, it is hard to be disappointed. The yogurt cheese is impressive each time so long as you use good quality yogurt. The Cuisipro Donvier simplifies the process as you just pour some yogurt in the maker and refrigerate it. You can come back in two hours and it will be ready. But if you like it thick, it is recommended that you wait a bit longer. 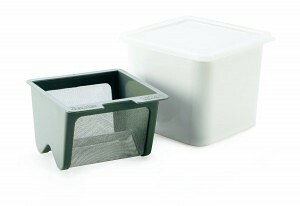 Like said on the features part, the unit comes with a container and a filter. The container has a lid for preventing odor in escaping to other foods. Overall, everything works and there is nothing absent we would have loved to see. The unit can carry a maximum of 3 cups of yogurt at a time and it will make 1 cup of yogurt cheese out of this. For most families, this will be enough. But if yours is big, its capacity might be a little inconvenient. As a matter of fact, it is the only flaw with this yogurt cheese maker. Also included are instructions which are more than adequate. Apart from that, recipes have also been added which is always a helpful addition. The Cuisipro Donvier yogurt cheese maker is so easy to clean. Starting with the container, you can use some soap and a sponge and it will come out shining. As for the mesh filter, you can do the same. For those with a dishwasher, it gets even better because this yogurt cheese maker is dishwasher safe. Consumers have fallen head over heels with the Cuisipro Donvier yogurt cheese maker. Those who have been using cheese clothes and other methods in making yogurt cheese admit that using this makes the process very easy. Adding to that, the results are amazing every time. Overall, this yogurt cheese maker has got really good reviews. If you are looking forward to substituting mayonnaise, cream cheese, sour cream or whipping cream with yogurt cheese, the Cuisipro Donvier yogurt cheese maker is the only thing you need. It works well, it is easy to clean and very durable. But most of all, it comes at an affordable price and you will not regret buying it. This entry was posted in CuisinPro and tagged cuisinpro, donvier, yogurt cheese.